Men.Style.Com has a wonderful feature that asks different people what ten things are essential to own. The results are always instructive. Today, it is Easy and Elegant icon George Hamilton who is kind enough to show us what matters most for the bon-vivant and jet-setter in all of us. His example of his dark blue suit is brilliant. 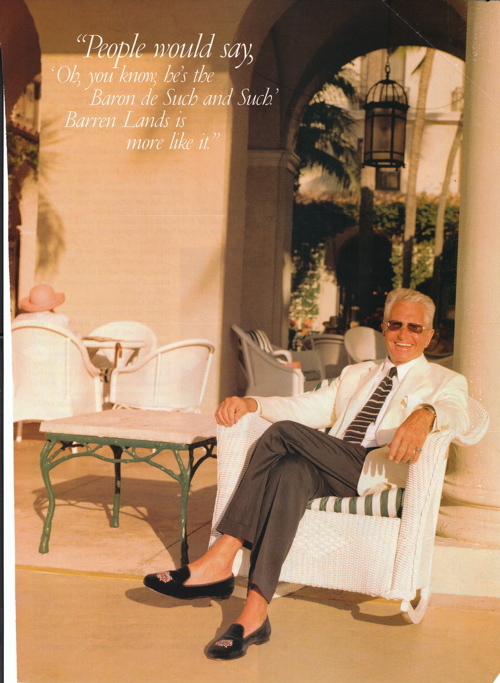 This entry was posted in Elegantology and tagged George Hamilton, men.style.com. Bookmark the permalink. I’ve always thought him stylish but strangely sleazy. Am I wrong here? On the other hand, I wouldn’t mind dressing like him if I could afford it. Also, I can’t countenance a man with a facelift, however well it might be done. E&E, I keep trying to add your site to my daily-update blog list but it isn’t coming up. Have you any technical issue I should be aware of? Hello Mr. Lane, there are a great many things on his list that I wouldn’t mind having. I’d even settle for the tan. I’m with AL in thinking there’s something a little dodgy about him – he’s just a little too orange. However, I can’t find fault in these recommendations. It’s a timeless selection of classics. AtB, ain’t it the truth! Sir Flutter, it’s the fake tan these days. But, as you so rightly point out, his taste is impeccable. I had dinner with Sir Fopling and his delightful fiancee the other night in London. He’s lots of fun and very charming. He was my guest in Baltimore during the summer and we had a great visit. I was at a bookstore last night and flipped through Mr Hamilton’s new memoir. It is cheesy beyond belief, but the Tennessee Williams-esque early chapters (much-married fortune-hunting mother, spectacularly fey half-brother given to dressing up in mom’s clothes, dashes in and out of private schools paid for by momentary stepfathers) are rivetting. AL, I will wait for the movie. David Niven’s autobiography was the last I enjoyed. Although I have Peter O’Toole’s on the unread pile and would love to get hold of The Duke of Windsor’s sometime.